MIAMI TRACE LADY PANTHERS SECTIONAL CHAMPIONS — The Lady Panthers captured the Sectional championship with a 57-35 victory over Unioto Saturday, Feb. 18, 2017 at Adena High School. (front, l-r); Tori Riley, Hanna Reisinger, Samantha Ritenour; (middle, l-r); Gracie Lovett, Becca Ratliff, Cassidy Lovett, Shania Villaruel, Tori Evans; (back, l-r); Lena Steele, Grace Bapst, Olivia Wolffe, Morgan Miller, Shaylee McDonald, Victoria Fliehman, Tanner Bryant and Aubrey Schwartz. Miami Trace junior Tanner Bryant (20) puts up a jumper in the lane over Unioto sophomore Jocie Fisher (21) during a Division II Sectional championship game at Adena High School Saturday, Feb. 18, 2017. Bryant was the game’s leading scorer with 25 points. Fisher led the Shermans with 17 points. Miami Trace senior Tori Riley takes a turn at cutting down the net after the Lady Panthers’ convincing 57-35 Sectional championship victory over Unioto at Adena High School Saturday, Feb. 18, 2017. 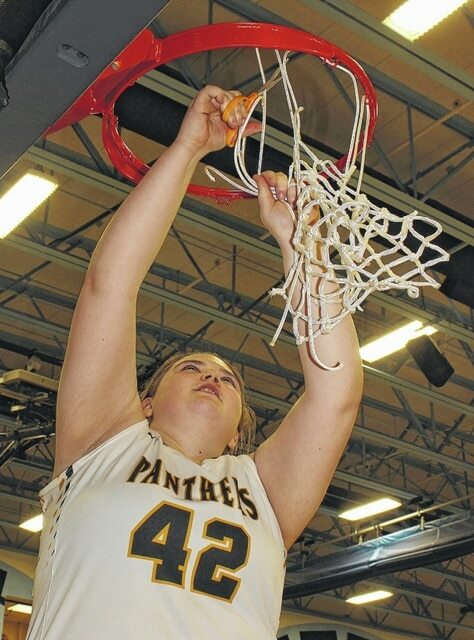 FRANKFORT — The Miami Trace Lady Panthers captured a Sectional championship and hit the 20-win mark for the season Saturday before a very large crowd at the Adena High School gymnasium with a 57-35 rout of the Unioto Shermans. Miami Trace improves to 20-4 on the season. The Lady Panthers (a No. 2 seed) move on to the District tournament where they will face a No. 1 seed, Sheridan. The teams will square off Thursday at 8 p.m. in the District semifinals at Southeastern High School. In the other Sectional final Saturday, No. 1 seed Chillicothe rallied to beat No. 5 seed McClain, 36-32. Chillicothe will play Warren at Southeastern High School at 6:15 p.m. Thursday. The winners of those two games will battle for a District championship Wednesday, March 1 at 7 p.m. at Southeastern H.S. Miami Trace junior Tanner Bryant was the game’s leading scorer with 25 points. Sophomore Cassidy Lovett also reached double figures with 10 points. She led the team with four rebounds. Freshman Shaylee McDonald scored 10 points. 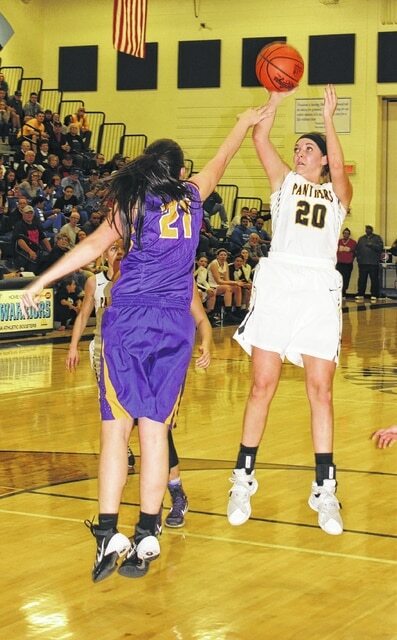 Junior Victoria Fliehman scored seven points and led the team with four assists. Sophomore Jocie Fisher led Unioto with 17 points. Seniors Morgan Popp and Caroline Thiel both chipped in five points for the Shermans, who finish the season with a record of 17-7. Miami Trace took a 4-0 lead on baskets by Bryant and Fliehman. The game was tied, 4-4, 6-6 and 8-8, but Unioto never led in the game. Miami Trace led, 12-11 at the end of the first quarter. The second quarter was the beginning of the end and Miami Trace finished putting Unioto away in the third quarter. Bryant converted the old-fashioned three-point play to start the second quarter. Unioto clawed back a bit, pulling to within one point, 17-16, with 5:19 to play in the first half. Miami Trace pulled away with a 12-3 run at the end of the half to take a 31-21 lead into the locker room. The Lady Panthers came out with a very strong third quarter, starting out with a 16-0 run for a 47-21 lead with just under five minutes to play in the third. It was 51-28 Miami Trace at the end of the third. The fourth quarter was a wash with Unioto scoring seven to six for Miami Trace, thus producing the final tally, 57-35. This is head coach Ben Ackley’s fifth season at Miami Trace. 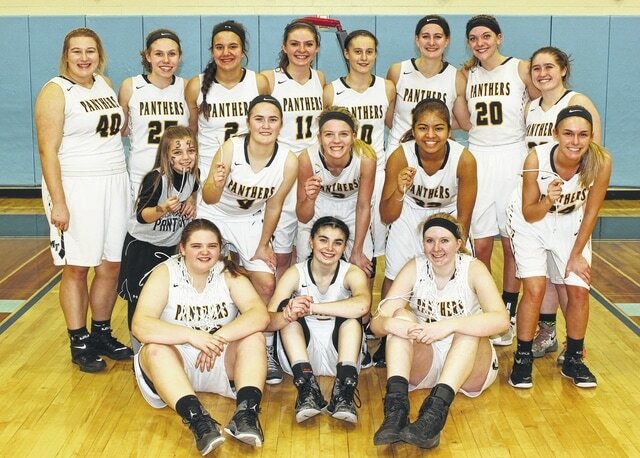 The Lady Panthers have won 19 games twice, 20 games once and last year they won 21. Ackley’s teams have now won three Sectional titles at Miami Trace. “They’re young, very athletic and dangerous,” Ackley said of Unioto. “We were extremely concerned coming in. Coach Miller is as good a coach as you’re going to find in the Southeast District. We knew he would have them coached up and prepared and he did. “His kids came out and fought,” Ackley said. “I thought once we settled into the game a little bit, our kids did a very good job of noticing that Tanner had a huge mismatch. I thought the game was one of mismatches and we did a very good job of exploiting the ones in our favor today. “Shaylee McDonald got caught a couple of times with a post player on her,” Ackley said. “I thought she did a very good job today off the bench for us. Morgan Miller and Olivia Wolffe also came in and gave us great minutes. “It was just a very positive experience for our kids and our team to be a part of this,” Ackley said. “The difference today, I thought, was that this was the second game in a row that we’ve closed the half out very well. I thought that our energy the first four minutes of the third quarter was huge. Tournament tickets on sale: Tickets for Miami Trace’s next game, a District semifinal match-up with Thornville Sheridan set for Thursday at 8 p.m. at Southeastern High School, will be on sale at the Miami Trace H.S. main office Tuesday through Thursday from 9 a.m. until 3 p.m. All tickets cost $6. MIAMI TRACE — Olivia Wolffe 0-0-0; Cassidy Lovett 3 (1)-1-10; Becca Ratliff 0-0-0; Hanna Reisinger 1-1-3; Shaylee McDonald 3 (1)-1-10; Morgan Miller 1-0-2; Victoria Fliehman 2 (1)-0-7; Tanner Bryant 10-5-25; Shania Villaruel 0-0-0; Aubrey Schwartz 0-0-0; Tori Evans 0-0-0; Grace Bapst 0-0-0; Samantha Ritenour 0-0-0; Lena Steele 0-0-0; Tori Riley 0-0-0. TOTALS — 20 (3)-8-57. Free throw shooting: 8 of 12 for 67 percent. Three-point field goals: Lovett, McDonald, Fliehman. Combined field goal shooting: 23 of 49 for 47 percent. Three-point field goal shooting: 3 of 13 for 23 percent. Rebounds: 19 (8 offensive). Assists: 11. Steals: 13. Personal fouls: 15. Turnovers: 8. UNIOTO — Carly Adkins 0-1-1; Summer Sigman 1-0-2; Morgan Popp 0 (1)-2-5; Cadee Causey 0-0-0; Emilee Coleman 0-1-1; Amber Cottrill 1-0-2; Jocie Fisher 8-1-17; Cree Stulley 1-0-2; Caroline Thiel 1 (1)-0-5; Kaylee Hagen 0-0-0; Cindellyn Murta 0-0-0; Kaitlyn Ellison 0-0-0. TOTALS — 12 (2)-5-35. Free throw shooting: 5 of 16 for 31 percent. Three-point field goals: Popp, Thiel. Combined field goal shooting: 14 of 31 for 45 percent. Three-point field goal shooting: 2 of 11 for 18 percent. Offensive rebounds: 7. Turnovers: 20.